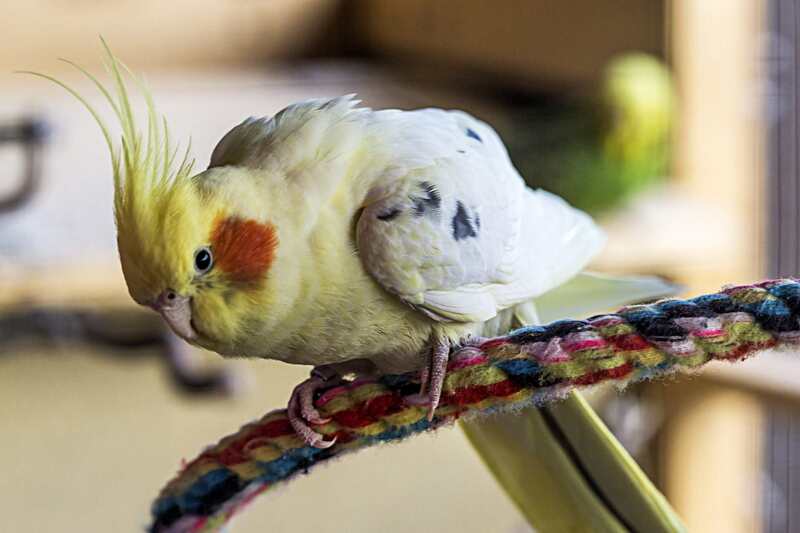 Prospective bird owners have a lot of choices when it comes to adopting a new pet -- there are so many different bird species available that it can be difficult to decide which type would be best suited to your lifestyle. Many people in this situation first decide on the size of the bird that they would like to adopt, and then pick a species in the range that they have chosen. If you've been thinking that a medium-sized bird would make a good companion for you, then check out the profiles featured below to learn about some of the most popular types of medium-sized birds. These beauties can make wonderful companions for bird owners of all walks! Available in many color variations, Cockatiels are widely regarded to be among the most common and popular pet bird species. True members of the parrot family, Cockatiels delight their owners with their cheerful whistling and ability to mimic many sounds, and they are highly intelligent and trainable to boot. While they aren't as big as many other parrot species, Cockatiels do appreciate having lots of space to play and exercise, so potential owners must plan ahead to provide adequate exercise for their feathered friends. Quaker Parrots, also known as Quaker Parakeets or Monk Parakeets, are another very popular medium-sized bird species. Known for their high intelligence levels, Quaker Parrots are often cited as one of the best species for learning to speak. Quaker Parrots are readily receptive to training as long as positive methods are employed, and can learn a number of fun and useful commands in addition to building quite impressive vocabularies. Their intelligence comes with a drawback, however -- since Quaker Parrots are so smart, they need a lot of time and interaction from their owners so that they don't become bored or depressed. Providing plenty of mental stimulation for these birds can be a challenge for some, so be sure to do plenty of research on this species before deciding to bring one home. For bird lovers seeking a medium sized pet that can add a splash of color to their lives, a Rainbow Lorikeet may be a good choice. These eye-catching birds bond strongly to their owners and thrive in situations where their human family members can spend plenty of time playing and socializing with them. Unlike many other bird species, Lorikeets need a specialized liquid nectar-based diet, which can be challenging for many people to provide. Because of this, Lorikeets are not the best choice for just anybody. However, for committed owners, they can make delightful, loving companions. Some people who want a medium-sized pet bird may not be interested in a parrot species at all, and that is where pet doves are often an excellent choice. Doves are quiet, gentle, affectionate birds, and do well in apartment settings or with owners both young and old. Because they are not hookbills, they do not have the capacity to cause the painful bites that parrot owners know all too well, and this can be a huge plus as far as training is concerned. While they don't have the ability to learn speech, Doves are very smart and can be taught a number of commands, both fun and functional. They are known to be quite hardy birds and may be a good choice for calm, older children who are interested in keeping a pet bird of their own. One of the most popular and recognizable medium-sized bird species is the colorful Sun Conure. These eye-catching birds offer all the beauty and personality of a larger parrot in a smaller, more manageable size. Potential owners should note that these birds are probably not a good choice for those new to keeping parrot species -- Sun Conures are parrots in every sense of the word, and their personalities are just as robust as their dazzling colors. With proper training and socialization, Sun Conures can make sweet and loving pets, but they need owners who can commit the time and effort necessary to keep them occupied and entertained so that they don't become bored and resort to destructive behaviors.